A stunning emerald cut sapphire is accented by a cluster of princess cut diamonds in a modern geometric design. Perfect as a gift or as an engagement ring, this beautiful piece can represent your true love and commitment, as well as the promise of a wonderful future together. 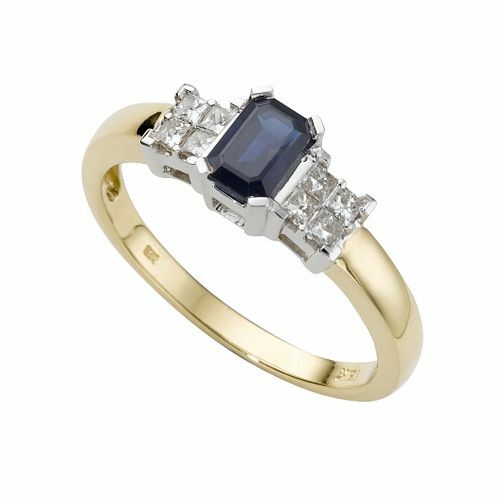 18ct gold sapphire and diamond ring is rated 5.0 out of 5 by 6. Rated 5 out of 5 by Anonymous from Beautiful sapphire and diamond ring My husband surprised me with this ring as I had damaged my original engagement ring. Simply stunning.